VINTAGE COSTUME ESTATE ANTIQUE JEWELRY EARRINGS! 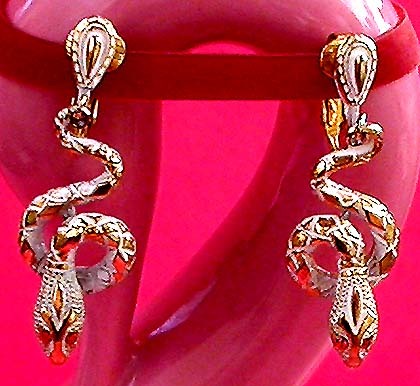 Art White And Gold Snake Red Rhinestone Goldtone Vintage Dangle Clip Earrings For Weddings, Proms, Pageants And Parties! Item #E168187 - Art White And Gold Snake Red Rhinestone Goldtone Vintage Dangle Clip Earrings. Size: Length: 1 1/4". Width: 5/8" at the widest point. The senuous coiling body is thoughtfully articulated in white and gold and accentuated by two glittering ruby red eyes. So exotic and regal. Clip backs. Excellent Condition. Fabulous earrings for weddings, proms, parties and special functions! US$68.00. SOLD.